The fortress of Fyrkat in Denmark. 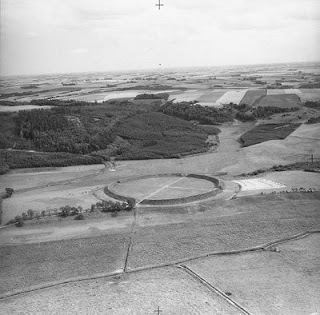 The Viking fortresses of Trelleborg, Aggersborg, Nonnebakken, and Fyrkat played a decisive part in the battles for power at the end of the 10th century. During the Viking Age, both defence and warfare involved ships, although it is still uncertain whether and how the Danish Viking fortresses were associated with the contemporary royal naval power. “The King’s Fortresses“ project attempts to answer this through archaeological investigations and excavations in the vicinity of the fortresses. Archaeology has contributed greatly to the understanding of Viking lifeways. Viking houses were built with timber, stone, and turf. In this class stratified society, large chiefly estates with good pastureland and large boathouses were the homes for local earls. Inside the houses were central fireplaces for warmth and cooking. Remains of cauldrons and steatite vessels, together with other artifacts such as whetstones for sharpening knives and loom weights from the upstanding looms that women used to weave fine woolen clothing, offer glimpses of domestic life. Implements for farming, hunting, and fishing along with animal bones from middens provide information on activities involving subsistence as well as those involving economy and trade. Charcoal pits, molds, slag, and recovered implements point to highly skilled craftsmanship in metalwork while the Viking ships and their surviving wood ornaments are a stellar example of woodworking. At Oseberg and Gokstad in southeastern Norway, excavations of sunken Viking ships undertaken in the late nineteenth and early twentieth century revealed beautifully crafted sledges and wagons. Fine gold jewelry and inlaid silverwork from finds throughout the Viking world also show a high degree of craftsmanship. Chess games, horse fights, and wrestling were all part of Viking daily life, and finds such as the Lewis chessmen—beautifully carved figurines of walrus ivory—show the Vikings applying their talent as artisans to their entertainment as well as their livelihood. 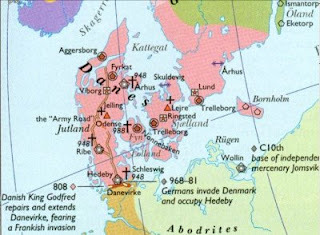 Military settlements such as Trelleborg in Zealand, Nonnebakken at Odense in Fune, Fyrkat near Hobro, and Agersborg near Limfjorden were all situated to command important waterways that served as lines of communication. 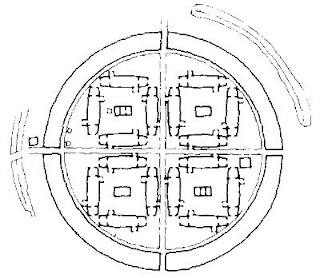 The layouts of these camps reflect influences of symmetry and precision of the Roman castra. The Vikings were organized in bands called liý, a kind of military household familiar in western Europe. A chieftain might go abroad with just his own men in a couple of ships, but more commonly he would join forces with greater chieftains. These were often members of royal or noble families, styling themselves as kings or earls, and they frequently seem to have been exiles—for example, unsuccessful rivals for the throne—who were forced to seek their fortune abroad. Such men were often willing to stay abroad to serve Frankish or Byzantine rulers as mercenaries, to accept fiefs from them, and to become their vassals. They thereby became a factor in European politics. Vikings were frequently employed by one European prince against another or against other Vikings.